An international team including researchers from the Institut d’astrophysique de Paris discovered a giant gas cloud escaping from a warm, Neptune-mass exoplanet. These results are published in the journal Nature on June 24, 2015. Escaping gas from massive hot planets had already been detected by teams from the Institut d’astrophysique de Paris (Vidal-Madjar et al. 2003 in French), and in one case, space weather-like temporal variations were even observed (Lecavelier et al. 2012 in French). For the first time, the team led by David Ehrenreich and Vincent Bourrier (Observatoire de Genève) observed hydrogen gas escaping a Neptune-mass exoplanet: GJ 436b. Moreover, they discovered that the gas is spread as a giant cloud forming a cometary tail around the planet. 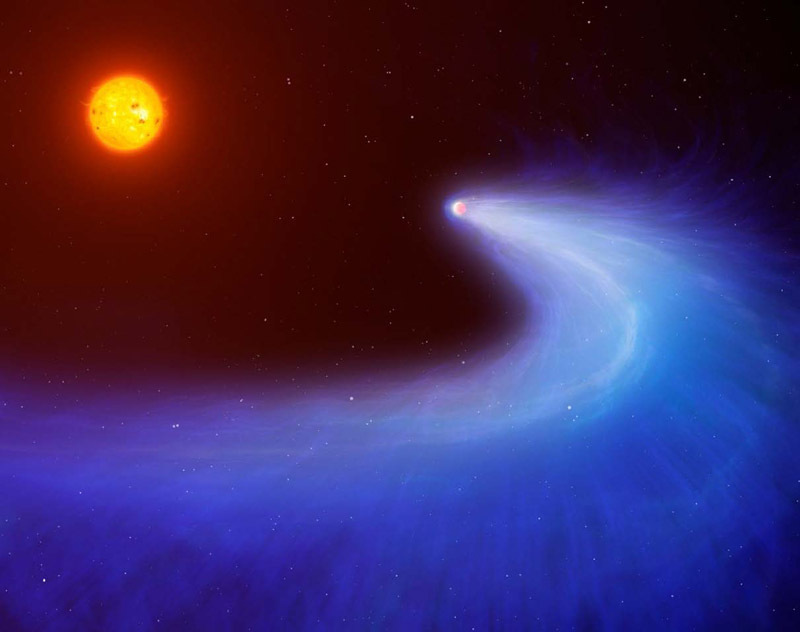 The researchers analyzed the observations of the exoplanet GJ 436b as it transits in front of the host star. The observations were obtained with the Hubble Space Telescope, and in the ultraviolet domain, in which the atmospheric signatures are often stronger than in the optical domain. Moreover, the amount of gas detected in the spectrum during the planet transit is much larger than expected: the astronomers have detected a hugely extended atmosphere that surrounds and trails the exoplanet, like a giant comet, covering around 56% of the star’s surface (this is enormous, compared to less than 1% covered by the planet at optical wavelengths). They propose that the cloud is mainly composed of hydrogen atoms and suggest that the exoplanet may have lost 10% of its atmosphere since its formation. These findings will help us to improve our understanding of the evolution of low-mass planets, in particular those in close-in orbits which strongly interact with their host stars.